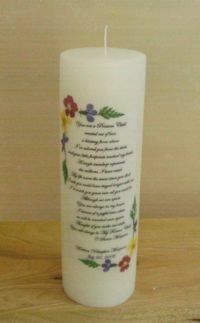 3" x 9" white candle with center wick. Choose from any of the hand picked and arranged flower selections. A single teardrop represents the millions I have cried. Includes clear wrapping and a color coordinated ribbon. Personalization includes 4 lines, 20 characters per line maximum. 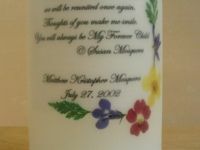 My Forever Child poem candle is made to order, please allow up to 2 weeks for delivery.